Our All Pistachio Gift Basket will make your mouth water! It's filled with all of our signature flavors, including Roasted Salted Pistachios, Chili Lemon Pistachios, Garlic Pistachios, and Jalapeno pistachios. NOMZ! 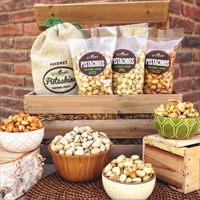 This Pistachio gift basket is the perfect gift for out of state family and friends as well as corporate gifts for our customers. It is packaged beautifully and you get great service from Yurosek staff! Yurosek Farms does a terrific job putting together the best baskets for gifts & then you are kept informed of the status of delivery! Our favorite gift to send & receive.